Looks like the rumours were true! 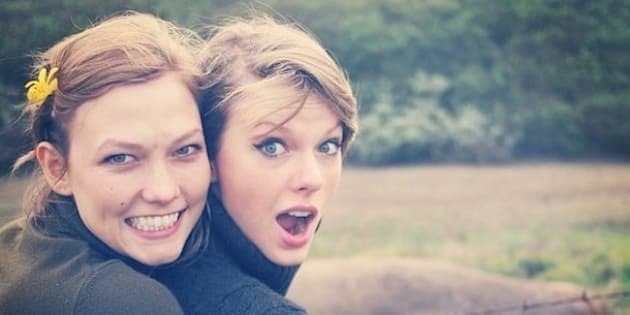 Real-life besties Taylor Swift and Karlie Kloss are the cover girls for Vogue's March 2015 issue, looking as adorable as ever. On the cover, "unstoppable, inseparable, adorable" besties wear complementing Louis Vuitton embroidered minidresses and earrings. Their blond locks are left loose and wavy, and both are wearing minimal makeup. The look-alike singer and model were photographed by Mikael Jansson for the cover shoot, which features Kloss and Swift reenacting the ultimate girls' road trip they took in Northern California almost a year ago. The cover reveal comes on the same day Swift released her new music video for "Style" -- and it's on the 13th, TayTay's lucky number. Coincidence? We think not. Kloss shared the cover on Instagram, captioning the pic, "Nothing better than sharing the @VogueMagazine March #PowerIssue Cover with your best friend @TaylorSwift."